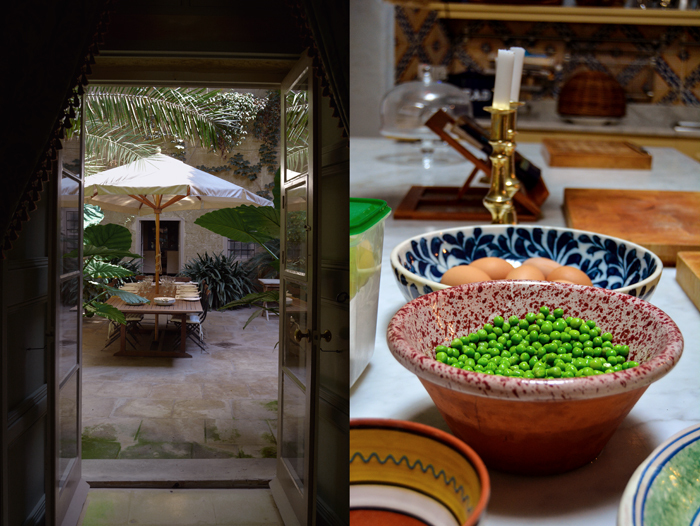 I’m in love – with my dear Maltese / British kitchen hosts Alex and Benjamin, with their beautiful 400 year old palazzo in Zebbug, their wonderful friends who joined us for a delicious traditional lunch and with the most gorgeous kitchen island I’ve ever seen in my life. A huge slab of Carrara marble on top of a simple wooden shelf took my breath away as I walked into the gorgeous kitchen. It’s one of those rooms that you never want to leave again. It’s welcoming and cozy, with an old fire place on one side, sparkling copper pots and pans hanging on a long limestone wall and a rustic wooden table at a glass door facing a bright courtyard. Here, you can cook, bake, chop and stir in peace and with plenty of space. A lot of the fresh produce comes straight from the garden, the cheese is made by a lady who lives in the village and Alex has enough ideas, energy and creativity to throw fantastic dinner parties on a weekly basis. It’s my Mediterranean heaven. The house is a gem and every detail feels effortlessly right. Found and restored by Alex more than 20 years ago, he saw the old walls’ beauty built of thick Maltese limestone. The charismatic man used his sense and sensitivity to bring his home’s true soul to life. Alex believes that everybody can create a nice house but not necessarily a home – a home needs a past, present and future and this palazzo has plenty of them all. It’s a peaceful oasis, tranquil and calm, in the middle of an ancient village. Hidden doors and winding corridors, steps and balustrades cut out of the island’s typical golden stone turn it into a playful labyrinth. The rooms furnished with elegant antiques are surrounded by walls more than 1m (3 feet) thick, the charm is rather introverted, here, the focus isn’t on the world outside but surprises with dreamy views onto the lush green garden and into the courtyard with an almost cloistral atmosphere. 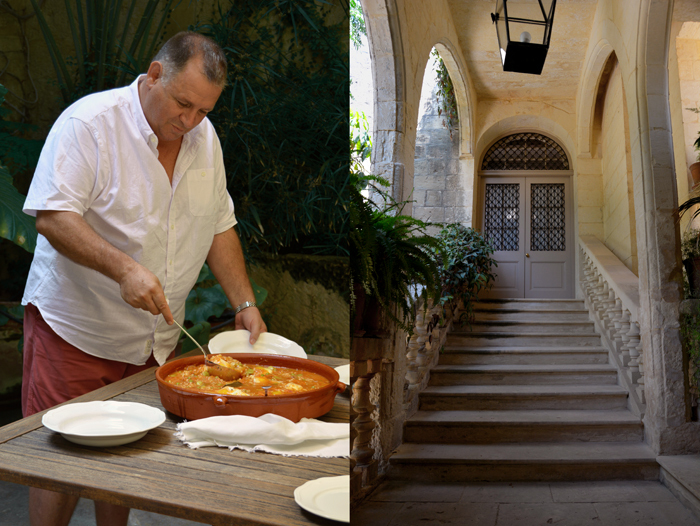 We met to cook and what is more fitting in this scene than an old Maltese recipe – the traditional Kusksu. The locals call it peasant food, I call it the most comforting, nurturing and scrumptious soup. Thick like a runny risotto, it’s made with lots of onions, concentrated tomato paste, fava beans and peas, enriched with Maltese short cut pasta – the Kusksu pasta resembling couscous – eggs poached in the fruity juices and Gbejna, the islands’ fresh goat cheese. The soft egg and cheese melt into the soup and spread their fine flavors, it’s delicious! Alex uses the tasty greens from their garden in Gozo, Malta’s sister island. 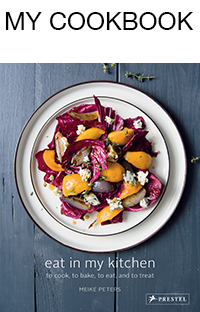 The fertile soil around another old house of his – this time from the 18th century – supplies the passionate cook and his food loving sous chef Benjamin with fresh produce all year round. I have only seen pictures of Casa Mezzodì in the village of Kercem but it looks like paradise. You can rent it for holidays, unfortunately without Alex in the kitchen, here’s the contact and some pictures. Alex loves to use his self-taught kitchen skills to treat his friends to casual lunches and extravagant dinner parties. I’m very happy to be one of them, thanks to Benjamin who I’ve been visiting for years due to his amazing treatments. Originally from London, Benjamin left England a while ago to live with his partner on the Mediterranean archipelago and work as a reflexologist. He is simply the best, he knows the foot map and its pressure points so well that I trust him blindly. If you ever happen to be in Malta, I can only recommend you to book an appointment with him – click here if you’d like to get in touch with him. Adapted from the fantastic ‘The Food and Cookery of Malta’ by Anne and Helen Caruana Galizia. Heat a generous splash of olive oil in a large pan and soften the onions and garlic for about 10-15 minutes, they should be golden but not dark. Add the tomato paste and cook for 1 minute. Pour in the water, stir in the beans, bay leaves and peperoncino and season with salt and pepper. Simmer for about 30 minutes or until the beans are al dente. Add the pasta and cook on low heat for about 10 minutes, stir once in a while. Add the peas, take the pan off the heat, cover and let it sit for about 10 minutes. Season to taste. Gently slip the eggs and goat cheeselets into the hot soup and let them cook off the heat for a few minutes. Serve the soup when the egg whites are still slightly soft, sprinkle with Parmesan and black pepper. What fascinates you about old houses – and especially – their restoration? I have been very privileged in my life to have been able to do a job I thoroughly enjoy. In my opinion, old houses allow us to revisit the past, which although can never be recreated, is fascinating to dip in to. It gives me a great deal of personal satisfaction to revitalise a period building and adapt it to contemporary living, whilst preserving the atmosphere and charm of past centuries. You collect antiques. Some say it’s impossible to stop collecting once you got started, do you feel the same? Where do you look for new finds? Some of us suffer from Horror Vacui, and I suppose it is fair to say that there is a magpie in all of us. However, jesting apart, an old house needs props, rather like a stage and it is the love of old houses which leads one to forming collections. I mainly find things at auctions and house clearance sales. I also like rummaging on the barrows at Portobello Road whenever I happen to be in London. 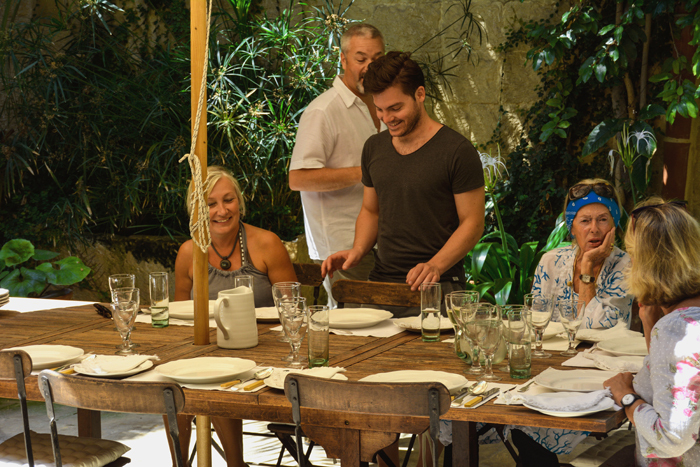 As a passionate cook you host wonderful lunches and dinner parties for your friends. How important are these gatherings for you? I am a very gregarious person by nature and nothing gives me greater pleasure than to see friends and family gathered round the table sharing food I have prepared. Besides, houses need to be filled with laughter and friends, and our house really comes alive when we give a dinner or a lunch party. As my partner is British, we frequently have house guests to stay. This always presents an opportunity ask our Maltese friends to lunch or dinner to meet them. 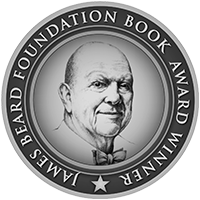 When did you start cooking and who or what was your inspiration? As I have always been (overly!) fond of my food, I remember experimenting with recipes at about 16. Although, I suppose that I started taking cooking seriously in my twenties. 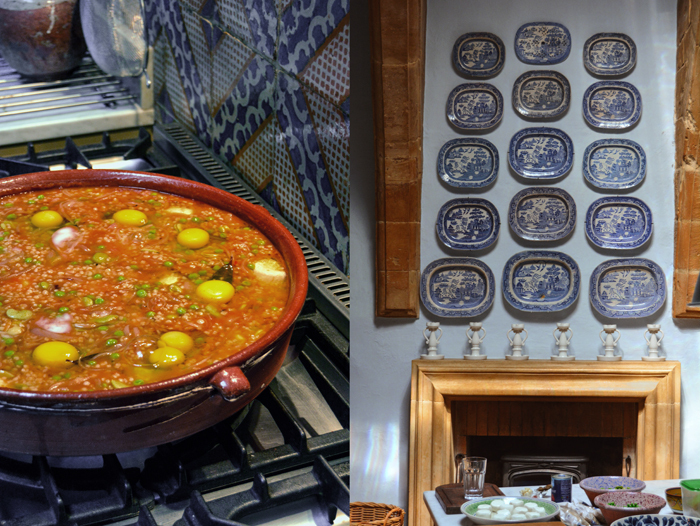 One of my earliest inspirations was the great Elizabeth David, who pushed boundaries in her time and was seminal in bringing the Mediterranean cuisine to the rest of Europe. Malta at the time was still very British, with a tendency towards food of the meat and two veg variety, in spite of the great choice of Mediterranean vegetables available in local markets. I discovered a worn paperback copy of Elizabeth David’s Italian Food in the local RSPCA second hand bookshop, and it was this publication that flung open the doors for using local ingredients, and I still dip in to it to this day. Later on I discovered The Food and Cookery of Malta by Anne and Helen Caruana Galizia, and this publication has been my most thumbed cookery book since, as it revives all the traditional and wonderful Maltese dishes. Some of the fresh produce you use in your kitchen is grown by your gardner in Gozo, from Malta’s sister island, where you also spend a lot of your time. What are the differences between living in Malta and in Gozo? 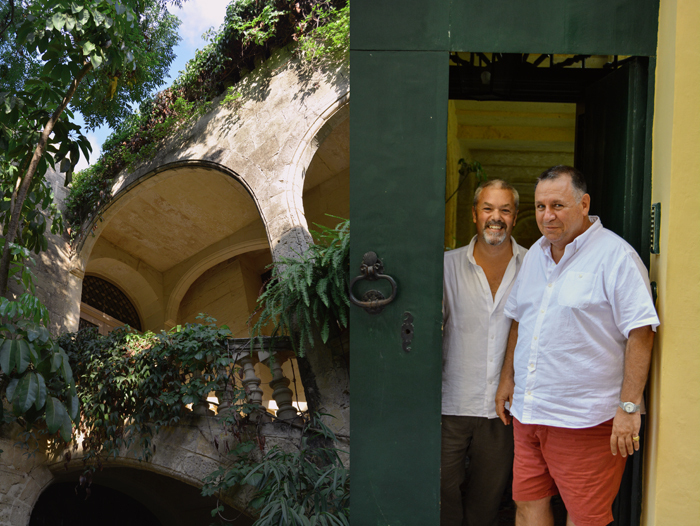 We are very fortunate to have a weekend house called Casa Mezzodì in the village of Kercem in Gozo, where the garden is looked after by a very special man called George Spiteri. George is passionate about growing indigenous crops using organic methods, and we are very privileged to be able to have these vegetables made available to us. Gozo is essentially composed of rural communities living off the land and the sea. 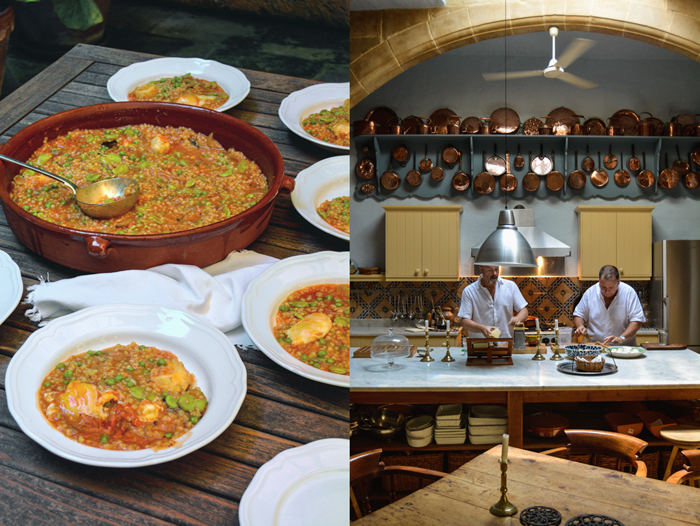 In spite of the close proximity, Gozitan kitchens produce different fare to Maltese ones. 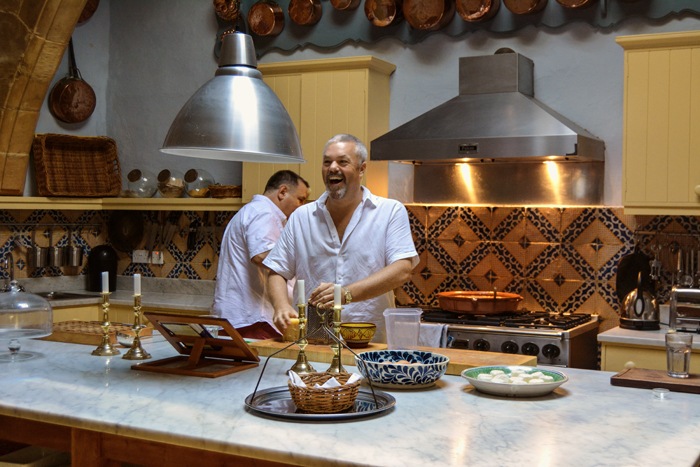 Gozitans being particularly inventive with stretching ingredients, creating delicious pies and stews made with the wonderful vegetables and fresh fish available. While we rarely venture out to restaurants in Malta, in Gozo we take every opportunity to visit the charming fishing village, turned resort, of Xlendi which is a mere five minutes from our home. There, we visit our favourite waterfront restaurants, and especially enjoy the cheese-less Gozitan “pizza” or ftira as it is known locally, which is topped with unusual layers of thinly sliced potato, tomatoes, capers, olives, anchovies and onions. The freshness of the ingredients, without the heaviness of cheese, on the crispiest of bases is the most heavenly combination. 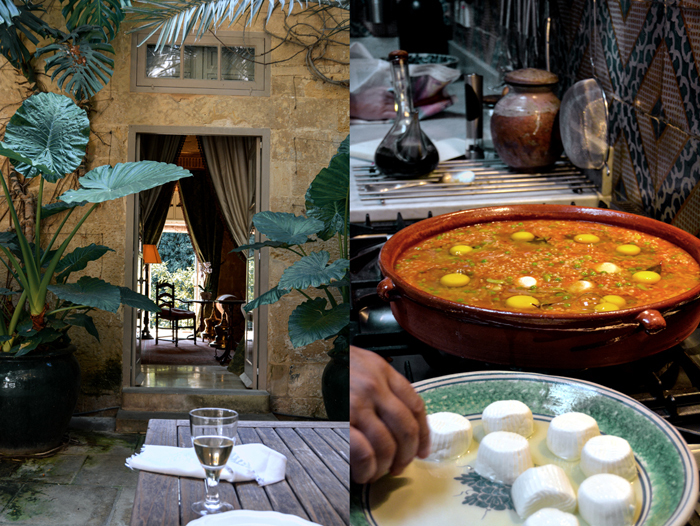 What do you love about the Maltese cuisine? The most simple, and frugal of ingredients, are always transformed into delicious dishes, which never fail to please. The stuffing of vegetables with rice, or meat, or fish…the wonderful pies, the vegetable stews, all combine European and Arabic influences and truly reflect Malta’s extraordinary geographical location at the crossroads between North, South, East and West. Where do you find inspiration for new creations in the kitchen? This wonderful age of communication has meant that one can browse for hours through fascinating blogs, such as yours, exploring new territory. In a sense, other peoples kitchens are brought in to your own at the click of a mouse, and perhaps, we do not fully appreciate how previous boundaries have now come down. I made a pea soup using terribly uneconomical petit pois, and best quality bacon rashers which I had pilfered from the deep freeze in my parents’ kitchen. Despite the velvety sweetness, and the beautiful emerald green colour of the soup, my long suffering mother was unamused that I had helped myself to her ingredients! I pay a weekly visit to the local farmers’ market at Ta’ Qali, which is about ten minutes from where we live. I have my favourite suppliers and will buy aubergines, green peppers and cauliflowers from Serafin, who comes from Siggiewi, which is a neighbouring village. I buy all my tomatoes, salads, cucumbers and qara baghli (the superb local sweet marrows) from Anna who hails from Mgarr. Of course, the produce is all seasonal, so it’s broccoli and cabbages in the winter, strawberries in the spring, and watermelons in the summer. I love cooking and eating according to the time of the year, and knowing that my ingredients have sometimes been freshly picked just hours before being brought to the market. You shared a recipe for Kusksu on eat in my kitchen, what are the memories you connect with this dish? We always had Kusksu on Good Friday when we were children, as this dish satisfied the very strict Roman Catholic fasting obligations. Once you had eaten it for lunch, it was very filling and would keep you going until supper time. 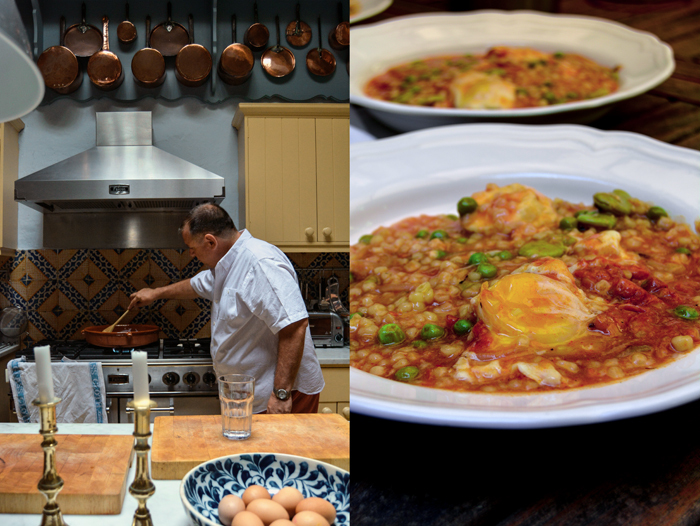 It is a firm favourite of mine as it truly reflects Malta’s cosmopolitan cuisine, and besides, I get to use the broad beans, peas, and onions which George Spiteri has grown in Gozo. Kelina Sultana was a Gozitan cook who worked for dear family friends. Sadly she died some years ago, but her lampuki pie (local fish pie) was the best I have ever tasted, and I would love to taste it one more time. It depends entirely upon what is in the fridge! For example, looking right now it would probably be a pasta dish using a variety of fresh vegetables, or a risotto with some chicken stock I made yesterday. As a child I loved my mother’s lasagne. Today it would be a risotto a la Milanese. I am quite happy cooking on my own, but really appreciate it when my partner Benjamin offers his assistance as a sous chef. Either, I have no preference at all. Both can be fun, and have their appeal. Farfalle with strawberry sauce, courtesy of Sophie Grigson in the London Sunday Times. Fortunately, I had offered our guests a trio of pasta dishes, so it was easy to avoid the disastrous results of combining strawberries with pasta! Wonderful! I have been lucky enough to be on the receiving end of Alex and Ben’s wonderful, warm hospitality and felt myself there whilst reading this! I will definitely give this recipe a go! Thank you. I’m glad I could take you there through my words and pictures! Alex and Benjamin create such unforgettable moments, through their beautiful characters, their house and food. I will never forget this day we made Kusksu together and enjoyed it at their table in the courtyard.